The south-eastern corner of England is a densely populated region but one which holds many rich bird habitats. For example, on the south coast of East Sussex and Kent there are undisturbed shingle beaches supporting nationally important tern colonies, and inland there are Surrey heaths, important for many nationally scarce species like Dartford Warbler and Woodlark. In north Kent there is a network of important sites along the Swale estuary which are of great importance for passage and wintering waders and wildfowl. These counties also often attract large numbers of passage migrants, including vagrant rarities from the continent. 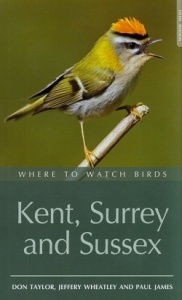 This guide explores the best birding sites in Kent, Surrey and Sussex. Several new sites have been added to this revised and updated fifth edition. Each site is described in terms of 'Habitat', 'Species', 'Access' and 'Birds', and the volume is illustrated throughout with line drawings and maps of each site. The manual seeks to enable birders to plan productive trips at any time of the year. 432 pages, 35 line illus, 54 maps.